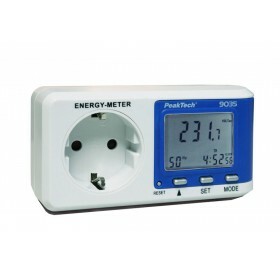 Energy / Power Meter New designed, high-precison Energy Meter for detecting the energy consumption of electrical appliances and to calculate the total cost of the electricity consumption of a device by entering the current price. Through the integrated power factor calculation all modern electronic consumers such as switching power supplies, TVs, fluorescent lights, LED systems and of course, resistive loads such as electrical heaters and hobs are precisely measured. In addition, due to the high resolution and the low response, even very small or standby loads are measured from approximately 1W. Additional Transmitter for Wireless Energy / Power Meter PeakTech 9040 Wireless transmitter to be added to the energy / power meter PeakTech 9040 to simultaneously monitor multiple sockets, up to a maximum total of four. Wireless Energy / Power Meter - Timed 4-channel Switch This newly developed energy cost meter can receive the electrical power of up to four transmitters. The device is counting the consumption continuously and through this weekly, monthly and annual consumption. So electrical loads can be monitored over a long period of time and energy intensive equipment will be identified. The wireless 2.4 GHz receiver technology allows a wide range between transmitter and receiver from up to 100 meters, so that the user can install the receiver unit in the workplace, from where it can monitor and also switch the inputs by pressing a button. Additionally it allows the programming of automatic on and off switching states depending on the day and time. Multifunction Power Analyzer with RS-232C Interface Multifunction power analyzer for testing of Watt, Power factor, AC V, AC A, DC A Hz and Ohm. Super large LCD 93 x 52 mm 2 , easy to read out the power, power factor, voltage and current values at the same time.